In 1895 a group of ten corn farmers in Faribault, MN banded together to enter the rapidly-growing canned sweet corn industry. These farmers were experts in sweet corn, knowing all there was to know about the soil, weather and rainfall, selecting the right seeds, and other planting and harvesting techniques common in those days. They had an entrepreneurial spirit and a passion to can only the best corn possible. That small start-up survived multiple wars, the Great Depression, the dust bowl, embezzlement, industry consolidation, and even prevailed after the factory burned to the ground. The desire to can the most premium quality, sweetest sweet corn has never wavered. Today Butter Kernel maintains strict quality standards, and offers a variety of sweet corn, green beans and tender peas picked at their peak flavor and canned within hours to lock in the nutrients. Enjoy these delicious vegetables year round! 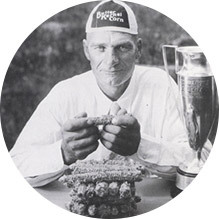 Ed Kottwitz poses with thirty cobs of sweet corn he gnawed clean to win the title of World Champion Corn Eater. Kottwitz held the corn eating record from 1931-1934.